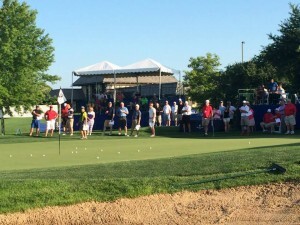 2014 Golf Classic was a great success! 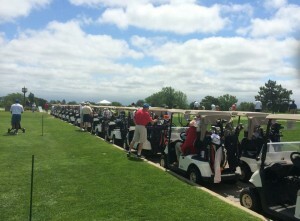 Father’s Day Sunday turned out to be the perfect day for the fifth annual Wichita Aero Club Golf Classic. After five fortunate years of playing in this tournament, it’s consistently ranked as one of my favorite rounds each year. There’s just something about playing the Crestview Country Club when the course is setup for the PGA Web.com Air Capital Classic. The excitement builds while driving down the cart path lined with banners of past tournament champions. Just a few steps in on the pristine course and you know it’s going to be a good day. Fortunately, the 17th hole grandstands were empty of spectators when my tee shot missed the par-three green on Sunday. 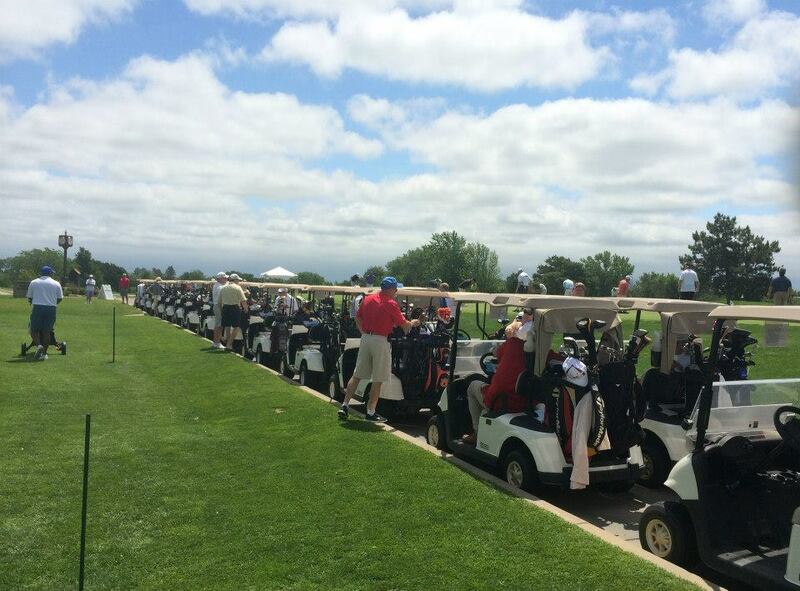 Missed shots aside, the 2014 WAC Golf Classic was a great success! 124 golfers enjoyed competing in a scramble format that led to prizes for the top three teams and a number of other contests. The always favorite 19th hole reception, appropriately situated just behind the 18th green was a welcomed moment to kick back and relax with a BBQ dinner and awards presentation. Elias Peterson accepts the annual Edward W. Stimpson scholarship check from WAC President Dave Franson, WAC Board of Directors Chairman Patrick Tuttle and WAC Education Committee Chair John O'Leary. Also pictured is Elias's father, Eric Peterson. 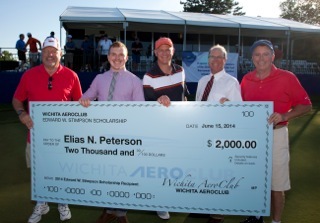 Joining us at the 19th hole reception was Elias Peterson, recipient of the $2,000 Edward W. Stimpson Scholarship. Elias is currently a student as Kansas State University at Salina working toward a Professional Pilot degree. The WAC Golf Classic wouldn’t be possible without the volunteers that make the event run so smoothly year after year. Over two dozen volunteers were on a mission to insure that the entire day ran smoothly for all participants. From the fast and friendly registration, to the constant flow of cold drinks and snacks, every golfer was treated like a pro. There were even volunteers stationed to assist golf carts in fording the river of Saturday night’s rain. In addition to corporate sponsorships, over $1,500 was raised by participating in a chance drawing to win $500. Proceeds from the drawing will benefit the Edward Stimpson Scholarship Fund. The Wichita Aero Club is proud to present Jerry Gregoire as its July 2014 luncheon speaker. Jerry Gregoire is the owner of Redbird Flight Simulations, located in Austin, Texas. He is a former PepsiCo and Dell executive, but his passion is flying. 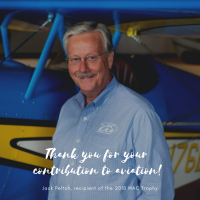 He is a single-pilot CJ driver and was the King Air owner as well as a King Air pilot. His company, Redbird Flight Simulations, does just what the title suggests: they build flight simulators. Redbird’s simulators can be used to earn some hours toward the private certificate and more extensively on the commercial ticket. Gregoire’s simulators are ingeniously designed at a lower cost than many simulators. Through Gregoire, Redbird has been preparing pilots for the skies for years and will continue to do so for many more. The luncheon will be July 17 at 11:45 a.m. in the Emerald Ballroom of the Doubletree Hilton Wichita Airport Hotel. Tickets for members are $30 and $40 for nonmembers. Tickets can be purchased online on the selected luncheon page under Events Schedule.